From the time Brian was born, his father would quiet him down by taking him on a tour of all the lights in the house. As he grew older, Brian's mother would take him to see local musicals every summer. It is these two things, along with Brian's love of computers and technology, that put him in the field he is in today. 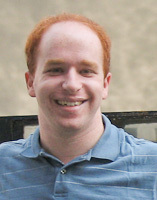 Starting in the Summer of 2001, Brian started working behind the scenes in a local Summer Theatre program. In years following, he has worked with many different programs both summer and community theatre, most recently working as Lighting Designer for Mainstage Center for the Arts in Blackwood, NJ. He graduated Penn State University in May 2010 where he studied Theatre Design and Technology with an emphasis in Lighting Design. Since college, Brian has worked at Altman Rentals in NY, followed by two years aboard cruise ships with Royal Caribbean Cruise Lines, then assorted work as a Freelance Technician in and around New York City. He recently got a job as Assistant Electrician with Disney on Ice and is currently touring the country entertaining young and old with spectacular and magical skating shows. His favorite things about the theatre include all the friendly people he meets there, the unique experience of live performances and the stories they generate. He enjoys programming shows, especially moving lights, troubleshooting lighting rigs and making the shows he works on look great.